St. Patrick's day is known for all the traditional fare, such as corned beef and cabbage, beer and green eggs and ham (or is that Dr. Seuss?). And I probably should have done a post on Irish Soda Bread, but I figured any holiday is worthy of these delicious cupcakes! Who wouldn't want to bite into a heavenly strawberry cream cheese filling on any day of the week for that matter? Besides, I made them on Valentine's Day and forgot to post them til now. So now that you know the truth, all I can say is that these cupcakes were really delicious. Not only that, they were a cinch to make. Make the cupcakes following the instructions on the box, adding in the 2 teaspoons of almond extract along with other wet ingredients. Bake as directed; let cool and set aside. Using a immersion blender or food processor, combine the cream cheese, strawberries, 1/4 cup sugar, and lemon juice. When the mixture is smooth, transfer to a pastry bag. Using a small tip, carefully squeeze the mixture into the top of each cupcake until you see the cupcake form a slight bulge. 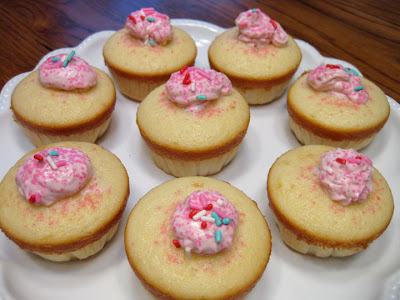 Do not try to overfill the cupcake because it will burst open. (I learned from experience!) 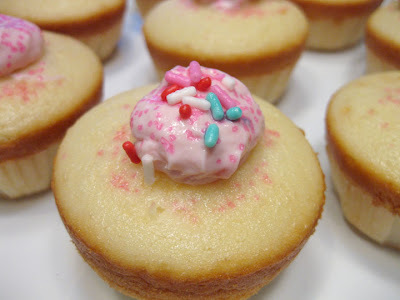 Finish off each cupcake with a small squeeze on the top and sprinkle with colored sugar or sprinkles. So gorgeous, cute, and delightful!! These look so pretty! I love that the filling is hidden inside. I can't wait until strawberries are in season. They look delicious. So glad they're not green. any day of the year, i'd take these :) yummy! WOW! These look so good! I'm going to have to remember this recipe for sure. I want you to know that me and fennel came close. I actually touched it in the grocery, lifted it up but then....set it back on the produce shelf. We are getting closer though. LOL! Lastly, unfortunately the Etsy treasuries expire. That is why the link didn't take you to it. Jasi's DID make the Front Page of Etsy though! Awesome! I am going to make that Smoky Beef Taco dinner in the March 09 Everyday Foods. Got the beef made yesterday and it is SO GOOD! The whole dinner looks Fab. Check it out if you can. These cupcakes are just precious. Strawberry cream cheese filling...sounds so delicious. I'm sure I could eat it with a spoon! Love your blog; so glad I found it!! Those are so cute and looks so good.